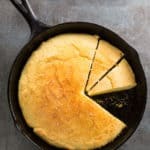 This easy skillet cornbread recipes takes only minutes to makes. It’s baked in a hot skillet and makes a savory cornbread that’s great alongside chili or roast chicken. I don’t know what to say about cornbread other than I love it. I love southern cornbread, with it’s coarse crumb and rich history. I love northern cornbread–the sweet cakey style that I grew up eating. And I love everything in between. But I love skillet cornbread the most. The reason is simple: the way the batter sizzles when it hits the hot skillet makes me smile. It’s just one of those things that never gets old to me. Skillet cornbread also feels comforting to make. I don’t care if I’m cooking a pressure cooker vegetarian chili on a busy weeknight. When I take a few minutes to preheat the oven, mix the batter, and bake the cornbread, I relax. I breathe. Then when it comes out of the oven, all golden and brown, I run a pat of butter of the top. It melts almost instantly, leaving a glistening cornbread top that looks like a gift–all shiny and perfect. There’s a million ways to make cornbread and a million styles of cornmeal to buy. For this one, I keep things simple. I use a finely ground cornmeal and mix it with an almost equal amount of flour. Then I add a little butter, milk, (not buttermilk for this one), eggs, and a spoonful of sugar and baking powder. Everything gets mixed together in one bowl. To get the best crust, heat your skillet in the oven as the oven preheats. When the oven reaches temperature, remove the pan from the oven and lightly grease it. Then, it’s time for magic. Spread the batter into the pan. Listen for the sizzle. Bake until the top turns golden brown. Sometimes, if I have a little extra time, I’ll spread butter on the top and pop the cornbread under the broiler for a minute or so. This makes the top extra brown. Since there’s always leftover cornbread, I usually eat a slice for breakfast the next day. I have to say, it tastes pretty great spread with cold butter and enjoyed with a cup of hot coffee. 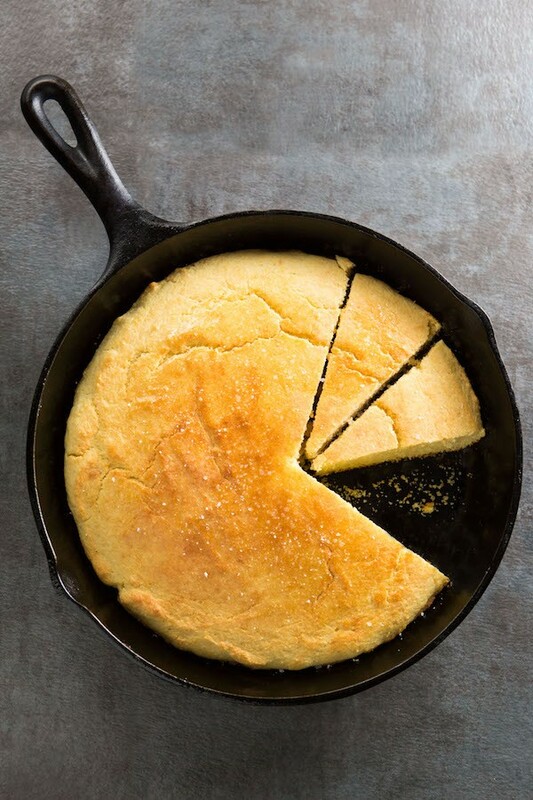 Easy Skillet Cornbread takes only a few minutes to make. Perfect served with a bowl of chili or alongside a roast chicken. Place 8-inch oven-safe skillet on the middle rack of the oven. Preheat oven to 375 degrees F.
Whisk together cornmeal, flour, sugar, baking powder, and salt in a large bowl. Add milk, melted butter, and eggs. Whisk until smooth. Batter will be thick. Spread the batter into the hot pan. Return the pan to the oven. Bake until golden brown, about 18 minutes. Remove the pan from the oven. Stab a pat of butter with a fork. Run it over the top of the hot cornbread. Sprinkle with kosher salt. (optional) Cut into wedges and enjoy. What gluten free flour do you use in this cornbread? Rice, sweet rice or combination? If you want to make this gluten-free, I’d use Bob’s 1:1 Baking Flour.